The aluminum F-150, whose SuperCrew recently posted a five-star overall crash rating from the NHTSA, has achieved five stars with all cab configurations, Ford announced last week. 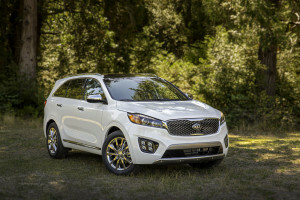 Also last week, Kia announced that the 2016 model year of its popular Sorento — which is more than half high-strength steel — snagged five stars overall from the government as well. Ford achieving five stars overall for every style of F-150 should close the door on the view that automotive aluminum can’t perform like steel. Ford attributes the rating to items like two-stage airbags as well as the design of the high-strength steel frame and aluminum body that collision repairers have been expensively preparing to fix. The Sorento doesn’t sell quite to the level of the F-Series, but at 102,520 sold last year, the crossover SUV isn’t exactly a concept car. And so, collision repairers should take note of what Kia partially credits for its five-star overall crash test rating: a lot of high-strength steel and glue. Kia says that the 2016 Sorento will be 53 percent advanced high-strength steel, 115 percent more than the 2015 model year, and it will have 14 percent more torsional rigidity. The vehicle will be “the most robust and durable Sorento ever,” Kia says in a news release, pointing out also “liberal application of industrial strength adhesives,” laser and large-diameter welding and dual-seal lip joints.